A full commitment to speed and efficiency means never having to compromise. 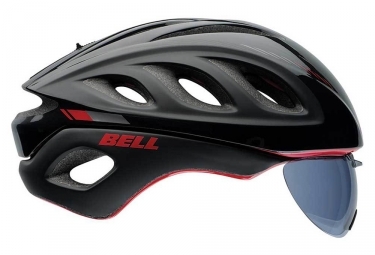 That’s the idea behind the Star Pro, a game-changing aero road helmet that gives riders the power to optimize performance on the fly in ever-changing race situations. Switch from full ventilation on climbs to wind-slicing aerodynamics in the sprints and flats. With its groundbreaking Active Aero technology, which can be engaged with the simple slide of a button, the Star Pro is engineered to be super fast AND super comfortable. Casque BELL STAR PRO SHIELD 2016 Noir Rouge clasificado 4.0 de 5 por 2. Rated 3 de 5 por Matt30400 de Bien Cela fait 3 semaines que je l utilise . Confortable. La visière est tres bien et pratique. La ventilation est jusdicieuse. Je dirais plus pour l hiver. Regleage tres bien Petit bémol. En ascension, au soleil il absorde beaucoup la chaleur.